From the Harvey and Lulu award–winning creator of Artbabe comes this riveting story of a young woman’s misadventures in Mexico City. Carla, an American estranged from her Mexican father, heads to Mexico City to “find herself.” She crashes with a former fling, Harry, who has been drinking his way through the capital in the great tradition of his heroes, William S. Burroughs and Jack Kerouac. Harry is good—humored about Carla’s reappearance on his doorstep—until he realizes that Carla, who spends her days soaking in the city, exploring Frida Kahlo’s house, and learning Spanish, has no intention of leaving. 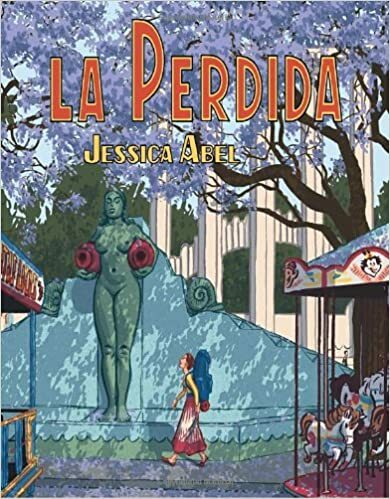 Jessica Abel’s evocative black–and–white drawings and creative mix of English and Spanish bring Mexico City’s past and present to life, unfurling Carla’s dark history against the legacies of Burroughs and Kahlo. A story about the youthful desire to live an authentic life and the consequences of trusting easy answers, La Perdida–at once grounded in the particulars of life in Mexico and resonantly universal–is a story about finding oneself by getting lost. La Perdida has a slow unfolding, somewhat melodramatic plot that takes place mostly through conversation. And it’s full of stereotypes of Mexico. It’s not an unpleasant read, but the protagonist’s sense of entitlement combined with her refusal to save herself drove me up a wall!